Mezzacorona is an example of superb production: vineyards, cellars, barrels and barriques. Equipment of utmost quality and modern technology runs alongside the professionality of our farmers, agronomists and oenologists who create elegant wines of strong character which boast that authentic Trentino flavour. 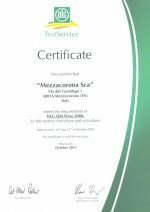 Mezzacorona's constant hard work and emphasis on quality throughout the whole winemaking process has been recognised by DLG ( Deutsche Landwirtschafts- Gesellschaft, German society for agriculture) an important body for certifying wines on an international level.